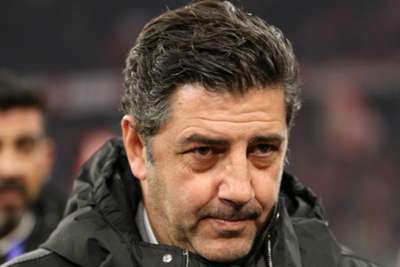 Benfica head coach Rui Vitoria said his side's desire to go into the Europa League as a seeded team motivated their 1-0 Champions League victory over AEK Athens. Both sides went into the game knowing it had no bearing on the final standings in Group E, from which Ajax and Bayern Munich progressed, but third-placed Benfica needed to improve on their points tally of four to give themselves a chance of being among the seeded teams in the Europa League. The Greek champions, who lost all five of their previous group games, looked set to earn the first point of their campaign until Konstantinos Galanopoulos was sent off shortly before Alejandro Grimaldo's 88th-minute free-kick bulged the net. Asked whether he had any difficulty motivating his players for a dead rubber, Vitoria told Eleven Sports: "No, because we knew we wanted to win and go into the Europa League as a seeded team. "We had 22 shots and we had a huge amount of time in possession. We deserved to win. "In the second half we were more aggressive and we wanted to attack the opponent. The players we introduced also brought more mobility." Vitoria said Grimaldo deserved his goal, and the 23-year-old expressed his satisfaction with the result and his own performance. "I am happy with the way things are going with me and for the team's dynamic," Grimaldo told UEFA.com. "We had a good match, deserved the win, we tried until the end, and I am happy that we did it. "We have to think game by game and see who we play against, but we are ambitious. "First we have the league and only then we'll think about the Europa League."